Left Front, Pad-stitched and ready to go. I cut 1/2″ strips of quilter’s cotton on the straight grain. I basted some places by machine, I hand-stitched the roll line and the neck curve. Step 1- Pressed the neck edge of the facing on the seam allowance, clipping where necessary. Sew facing to front, from bottom edge to “The Dot.” Trim. Step 2- Face buttonholes. I had some little trouble with this on the waistcoat, probably because I left it to near the end. This time I tried another way. I pushed pins straight down through the ends of each buttonhole, flipped it over carefully, and marked the lines with chalk. I made several machine keyhole buttonholes on waste wool and haircloth until I made one the appropriate length. A razor greatly assisted unpicking the top buttonhole when it went ever so slightly awry. 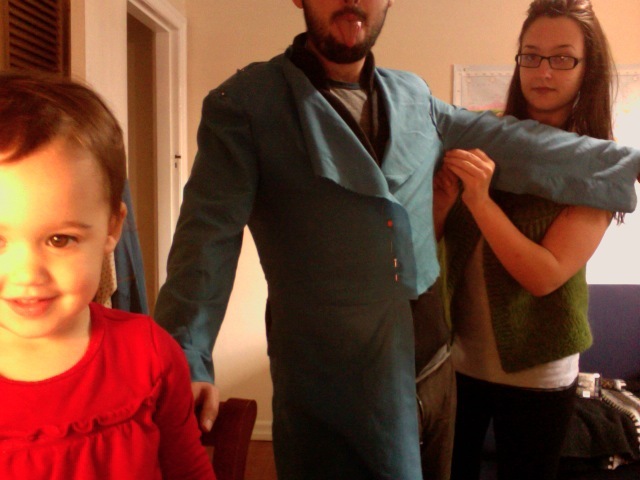 Then I opened them with a chisel and pinned the facing buttonholes behind the coat front buttonholes. Finally I stitched in the ditch around the piping to secure the two layers together. I used tiny machine stitches. 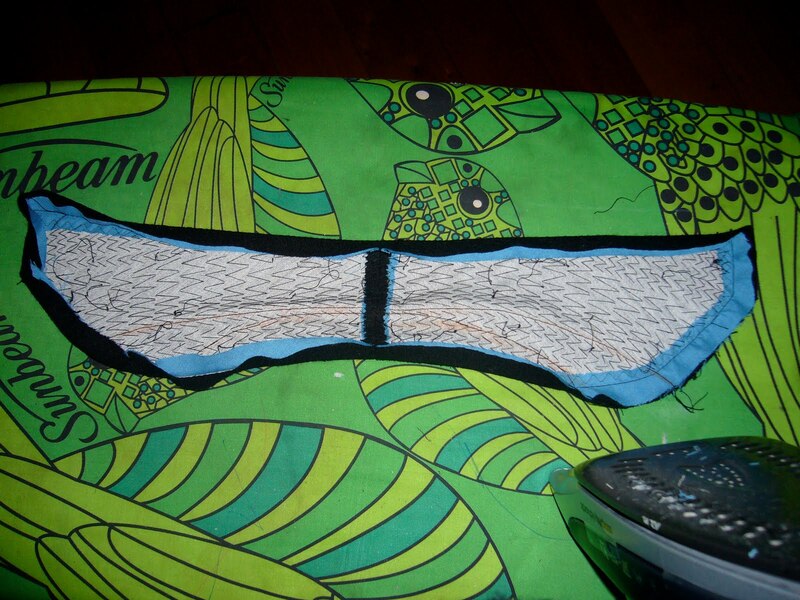 Step 3– Prepare upper collar. I snipped the seam allowance at The Dot to allow me to turn in and press the raw edges of the collar except at the neck edge. I had basted the interfacing piece in at the seam allowance, so I used my basting as a pressing guide. I also snipped the neck edge curve. I pressed it as sharply as I could, trimming all the way, and then basted along the folded edge. 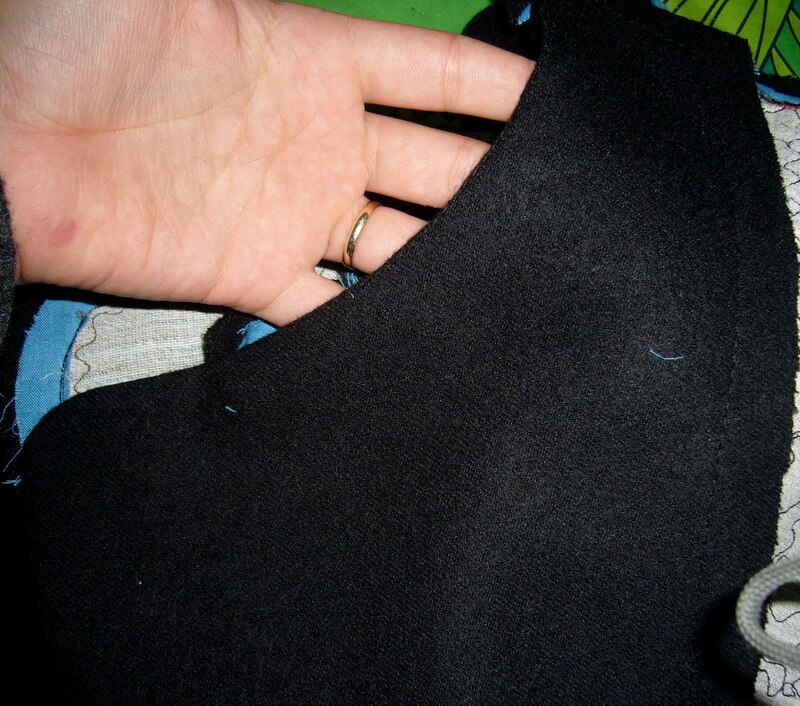 Step 4- Pad-stitch the under collar. 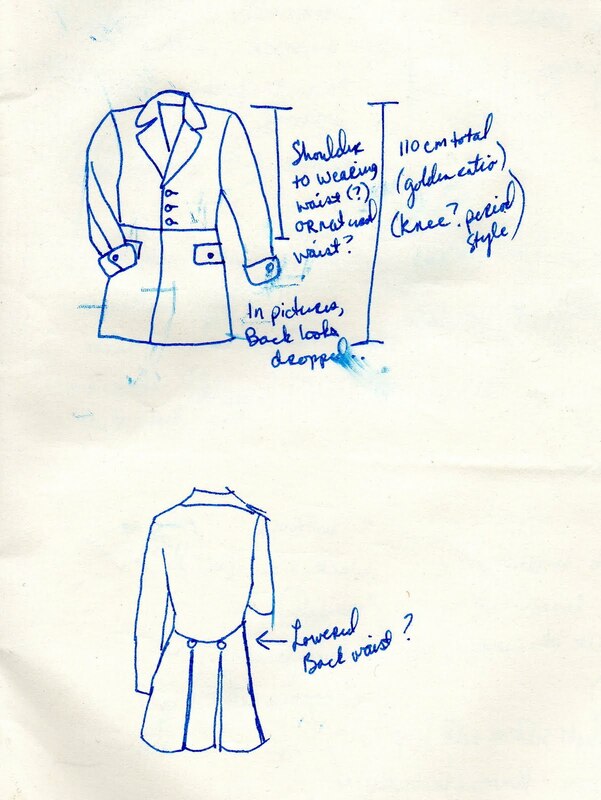 I pressed under all the seam allowances on the under collar and pinned the under collar on the coat, put the coat on Husband and marked the roll line. The edge of the collar should cover the back neck seam line, and it should lie smoothly around the neck. I don’t know of any other way to mark the collar roll line. Then pulled off the under collar, and used a tiny machine stitch to secure the roll line. I stretched the fabric width-wise as I stitched, to create a roll. It worked well. Then I pad-stitched the area between the neck edge and the roll line, called the stand. I used a 1/4″ stitch, fairly dense but quick because of the small area. On the other part of the collar, called the fall, I stitched a 1/2″ stitch. I made the stitches smaller and denser in the corners of the collar. 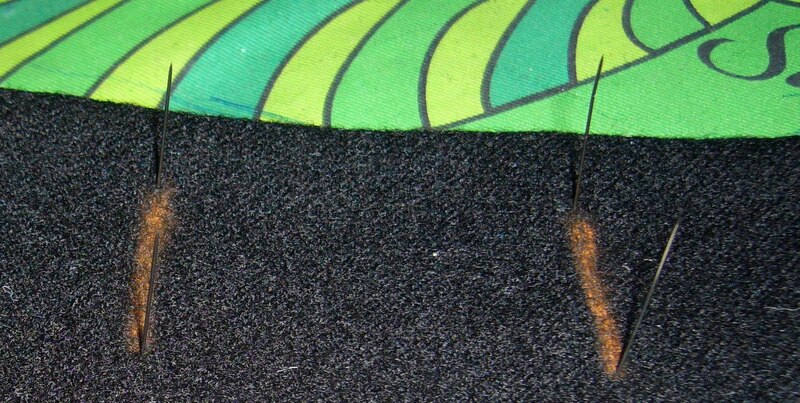 I did not catch the seam allowances in the pad-stitching. I should have trimmed the seam allowances more than I did, but my book was unclear on the point so I erred on the side of caution. Then I pinned the whole thing over the ham and gave it five good steamings, allowing it to dry before I attacked again. 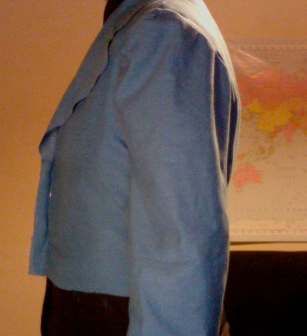 Step 5- Attach upper collar. 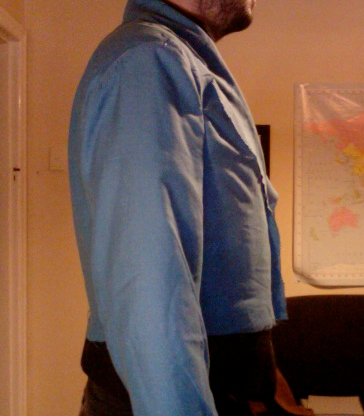 I pinned it to the neck edge of the coat, positioning right side of collar to wrong side of jacket. I needed to snip the seam allowances a little more as I pinned and then basted until it sat smoothly. 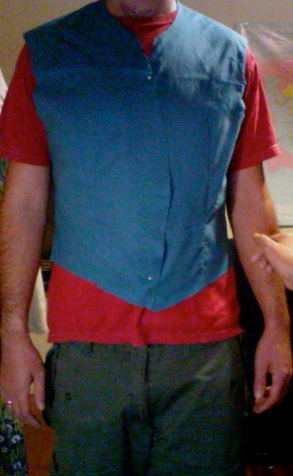 Then I stitched it in, trimmed the seam, and pressed it up into the upper collar. Step 6- Slip under collar beneath upper collar and stitch. I first pinned the edges together, then basted by hand. I started fell stitching at the CB outside edge of the collar, working to the notch. My stitches were less than 1/8″ apart, thank goodness for the Season 3 Madmen. When I reached the notch, I slip stitched the neck edge of the facing to the edge of the upper collar. The pressed edges butted up admirably, I just had to slip stitch them together. 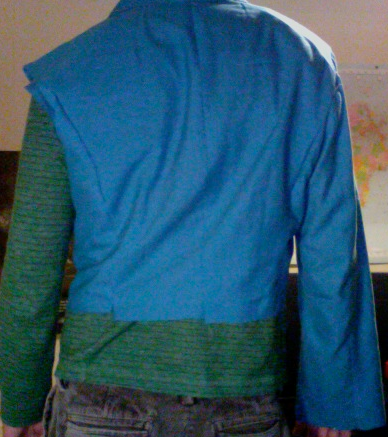 I did pin the top of the facing to the shoulder seam so I could work in the curve properly. Then I fell stitched the other half, starting at the CB and ending up at the shoulder end of the facing. 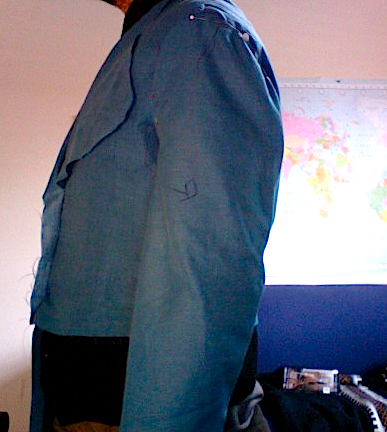 Finally, I stitched the neck edge of the under collar to the neck edge of the coat, covering all raw edges. This step took as long as all the other steps combined, but it paid off. I wasn’t stressed out, I didn’t worry about something slipping out of place or coming out puckered because my tiny stitches allowed me to subtly manipulate the edges as I stitched them together. Time-consuming, but much more control. I was sick of stitching by the time I finished the neck edge. Step 7- Steam, press, clap, roll, repeat. I spent an hour and a half steaming and pressing all those seams and edges, which paid off. 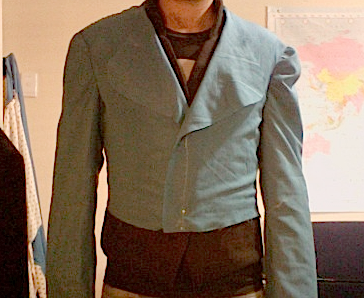 It lies nice and flat against Husband’s body, I was so afraid of screwing up the collar and roll line on this coat. I hate my last tailored jacket’s roll line, very nasty. By the way, if I mess up with tailoring terms, please feel free to call me on it. I’m only self-taught and can only get better. Next up- the sleeves. I should have started them by now, but the instructions went MIA. I remembered something weird about the sleeve instructions, so wasn’t game to start stitching without consulting them. I did a supreme clean and they turned up, so I can start them in the next day or two. From here on out I feel pretty confident I know what I’m doing (famous last words? ), having overcome buttonhole facings and roll lines. Also, please know I haven’t abandoned my Deco Coat. 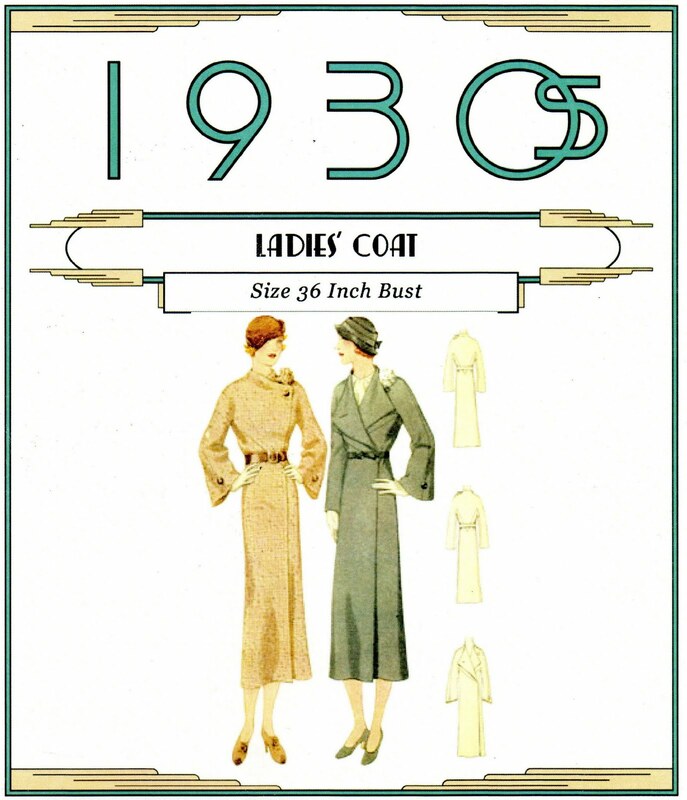 This morning I pulled out the pattern to transfer my alterations and made a lovely discovery- I have enough of the green windowpane cashmere to make a full-length coat. It doesn’t have any big tailoring features- no roll line, no collar, no set-in sleeves, probably no pad-stitching, no buttonholes. I think it will go together quickly, I’m looking forward to it. I plan to use some black wool piping to bring out the architectural seamlines and the edges, I’ll probably put in a few welt pockets with flaps and an invisible pocket a la K. King. First we had to choose buttons. 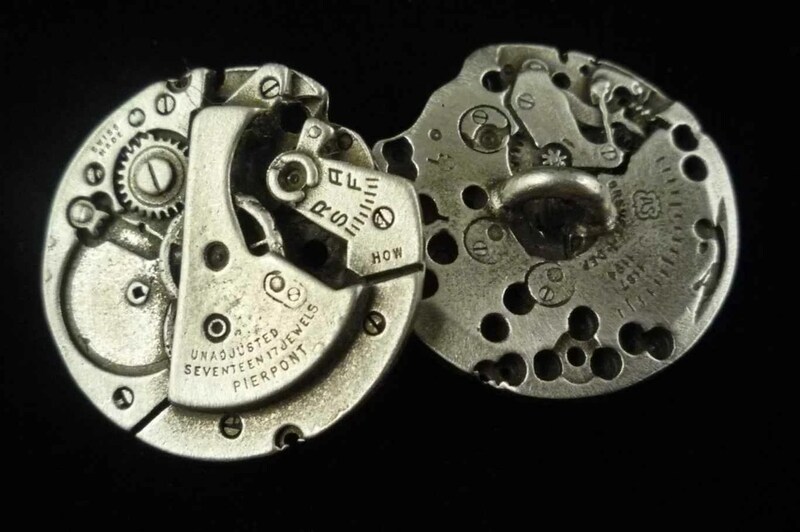 We (finally) managed to get the steampunk gears from Treasurecast– Five large and five medium. 1″ buttons for the fronts, I made the buttonholes 1 3/8″ according to my shank buttonhole guide. If they do prove slightly too large, the piped buttonholes will hold the coat front together. 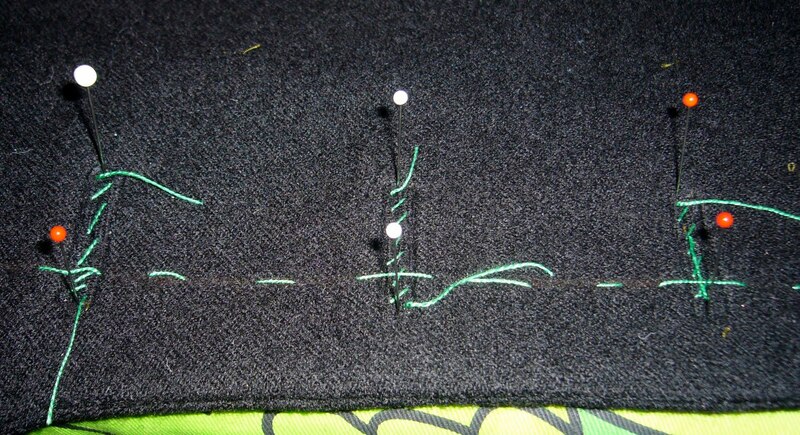 Buttonholes must be made before applying the interfacing. I used solvy to mark the CF and the buttonholes. Thanks to all the practice, they went in beautifully without a second thought. I stitched them shut with silk thread, apparently only silk thread doesn’t leave impressions when steamed and pressed. Left front after I cut buttonhole windows and catch-stitched them in place. 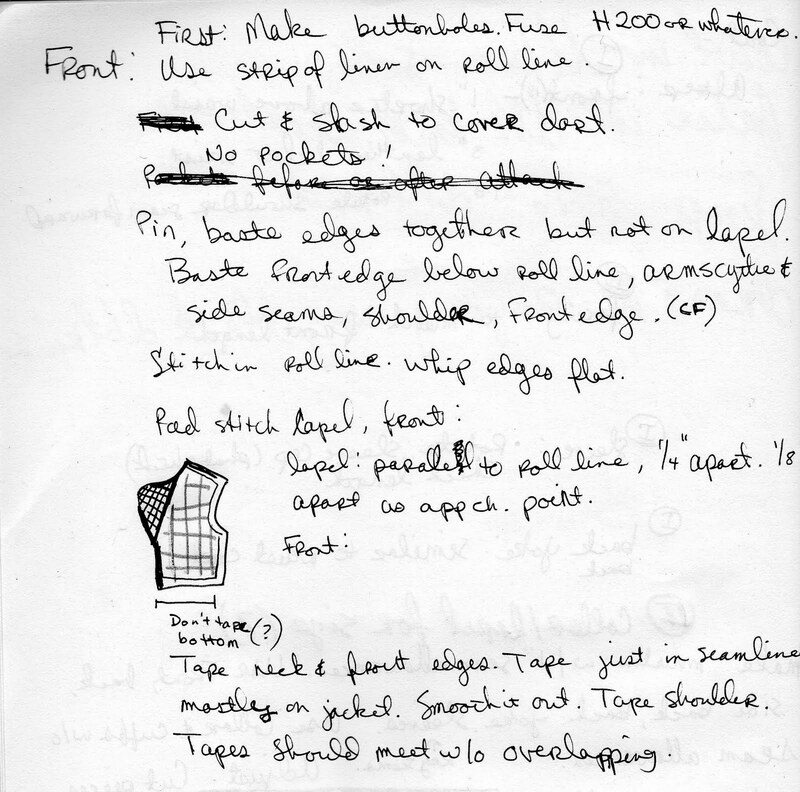 I made chest pieces and a shoulder pad pocket as per the instructions in one of my old tailoring manuals, then applied them to the interfacing with a serpentine stitch. The blue fabric is some closely woven cotton designed to help reduce bulk in the seams. I marked the pad-stitching grid: 1″ squares on the front, 1/2″ squares along the roll line and 1/4″ closer to the end of the lapel. Roll line. In addition to stitching it over my hand, I steamed it five times over a little lapel roll I made of scrap wool fabric. It worked like a charm. It was the best of times, it was the worst of times…it was the spring of Hope, it was the winter of Despair. 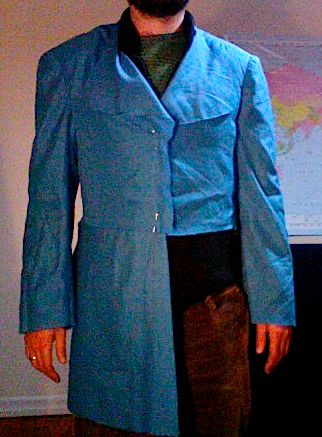 I felt rather deflated after the last (and as I thought) most brilliant attempt at a perfect sleeve for this coat turned out, well, mediocre. I don’t want to slave away on a coat for 50 hours only to look at mediocre sleeves for the rest of its life. I couldn’t decide which way to go towards making the sleeve work, so I left it alone for a few days and drank during my free time. Funny, that. Drink or sew, but mixing doesn’t seem to work well. After a few evenings of zero productivity, I decided to rotate the sleeve. 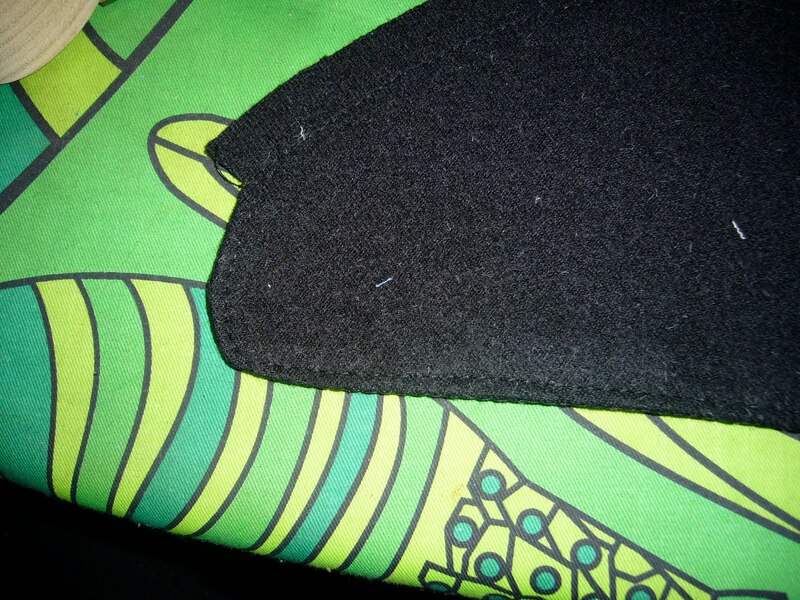 For the sleeve above, I matched the underarm seam to the bottom seam on the sleeve. This turned out to be incorrect, and a probable cause of sleeve-twisting. On the track of a new development, I ripped and re-positioned the sleeve, though I had to fudge the positioning a little bit. The front of the coat wanted to ease into the sleeve rather than vice-versa. I discovered an ungodly amount of ease in the back. Before I basted, I knew it wasn’t right. Better, perhaps, than the previous attempt but by no means good enough. 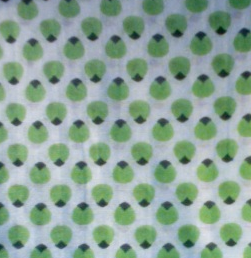 Let me be clear: this is the same sleeve as above, but rotated on the bottom by about 3/4″. I left the top of the sleeve as marked. Victory! I still need to take in the side back seam a trifle, but I think we have a sleeve now. I knew it could be fantastic. Now I need to pull the pieces apart, transfer the alterations to the pattern and we’re in business. Spring of hope! After an entire day spent in the trenches re-working muslins and sleeves, I finally feel in control. I raised the armscythe 3/8″ (shot in the dark, you have to start somewhere) and discovered a mistake I made before. When I altered the side back for broad shoulders, I created a funny back armscythe. 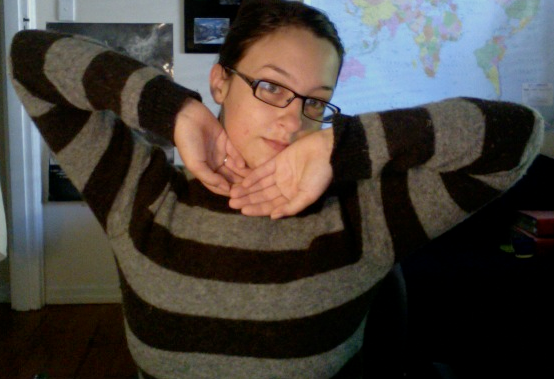 This accounts for the trouble I had setting the sleeves, as well as the residual front-reaching mobility issue. You can see my original curve, and where I changed it. I added just a little width to the top of the piece at the armscythe to fine-tune another alteration. I smoothed down the curve on the seam that connects to the back piece because the muslin told me to. Back to the armscythe- I discovered I made a clumsy free-hand curve when I used my handy new drafting tool to draw the new line. Measurements in Imperial and Metric. Huzzah! I switch back and forth constantly. Curve guides- it tells you where to apply the curve. I struggle with getting curves right. When I lined up the 6″-17″ section on my armscythe, I saw my mistake. 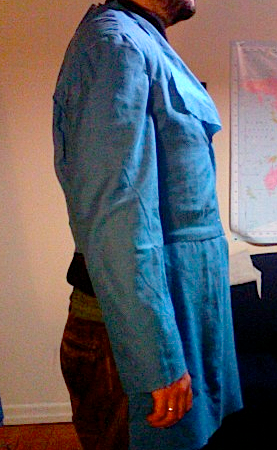 New coat muslin, now with raised armscythes. I thought: Too much ease. Then I realized I already had a sleeve with less ease. What a difference. Kat, you are a goddess and I’m sorry I every doubted. From here I felt I had some fine-tuning to do. For one, I noticed the shoulder seam sat weird on his shoulder. He has a broad shoulder fit issue and a forward rotation; at the outset I confused the two and lumped them together. The broad shoulders exaggerate the forward rotation. 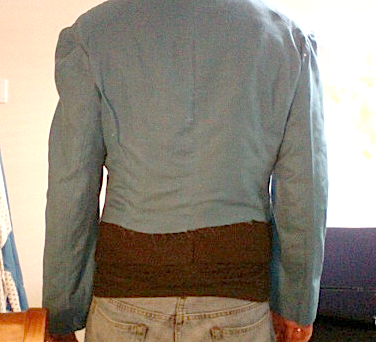 Once I gave him enough room across the back of his shoulders, the shoulder seam needed to be adjusted. This makes more sense. I marked where his shoulder seam should end. It turns out he needs a 11/16″ adjustment, not the whopping 1 1/8″ adjustment I had done. I also decided to tweak in the side back seam a little to reduce weird bulges. And finally, I decided to add one of the lower front pieces. On his right is the side with the old 1 1/8″ forward rotation. His left is the new and improved side. I still see some drag lines on the sleeve. Sleeve made from Kat’s alteration method, with a 11/16″ rotation. Old sleeve. We’re getting somewhere. I made a few little markings on the top of the back arscythe to nip it in just a little- roughly 1/8″. I think that will make the back of the sleeve sit nicely. It might eliminate the drag line at the elbow. I wonder if I am lining up the wrong marking to my underarm seam. Maybe if I rotate the bottom of the seam backwards it will eliminate those drags. Any other suggestions welcome. Also interesting to note that the finished length of the coat equals the finished length we determined mathematically using the Golden Ratio. 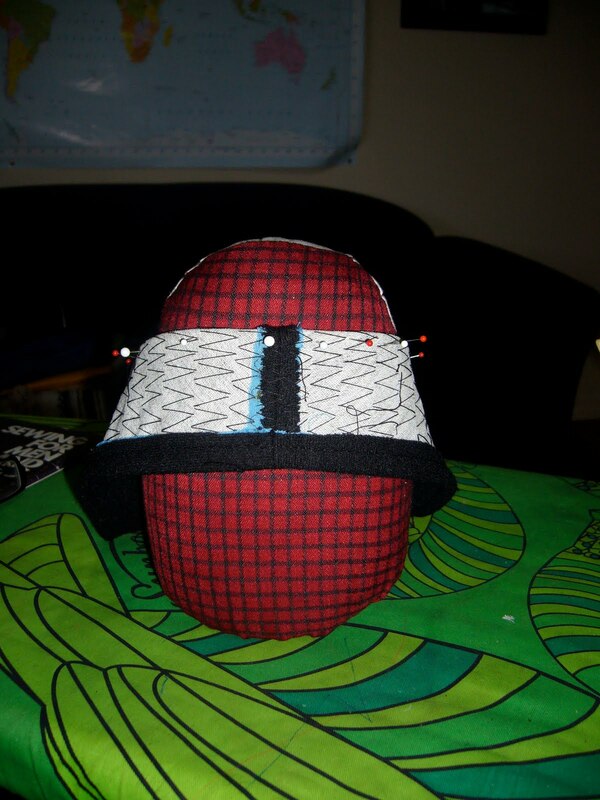 Huzzah for irrational mathematic constants applied to sewing! I’ll post more about that later. Perhaps I’ll get my husband to guest-post about it because he figured it out. I’ll play with the back armscythe and remove those drag lines. Then I can cut! Finally! I think I might start cutting the haircloth today. Those pieces won’t be affected by the little alterations I need to do. I know, I know the pictures are bad. I’m very sick of it, too. I’m also sick of all these fittings. How silly of me to think it would be so easy. I suppose it isn’t the coat body that is giving me a run for my money, but the sleeve and armscythe. I altered the back yoke piece to give more room across the back. 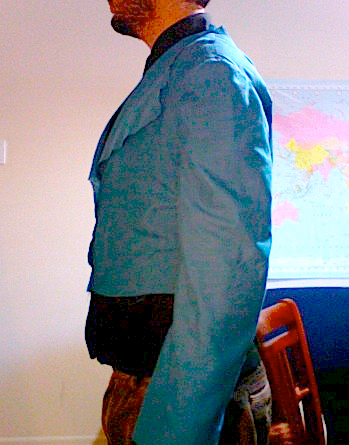 I used the waistcoat alteration as a guide, but I think I added too much. The seam seems to sit a little off the edge of his shoulder where I added width. Additionally, while I fixed the front-reaching mobility issues, it appears he can not comfortably lift his arms above his head. I believe the fix for this involves raising the bottom of the armscythe. Does that also include adding a little to the underneath part of the sleeve seam where it joins to the body? On a brighter note, I think the sleeve is in fact correct. It looks much more like a sleeve should than my previous sleeves. I can still see problems, but I think once I have the shape of the armscythe sorted, it will fall into line. This one is the Palmer Pletsch sleeve, though I have the Phat Chick sleeve in reserve. So to sum: shave a little width off the back armscythe on the back yoke piece. I think I added too much. Raise the lower armscythe by 1/2″ (why not?). Maybe add a little to the sleeve, too. I’ll take a little time and read my books. This muslin is really starting to get under my skin. I want it done. I want to cut the thing, I want to make it. I want to work on other projects, but I can’t get into other projects because this one is looming large in my mind. That is to say, I should have looked at FFRP first. Phat Chick Pattern after some alteration. Weeeeird. Long acquaintance with two-piece sleeves teaches me to first monkey with the upper sleeve, and then the under sleeve only if necessary. This is the upper sleeve. The left is the front of the sleeve. My fingertip points to the shoulder seam marking. Front, with Phat Chick altered sleeve. Not so bad, not so good. He had some mobility issues. I spent a few years in theatrical costume. During fittings we made actors reach their hands over their heads, touch their toes (as close as possible), reach across their bodies, jump, and twist. If their character needed to perform any particular physical activities, we’d try that too. If a garment doesn’t pass the mobility test, it’s no good. This sleeve does not pass the mobility test. Side. Ick! 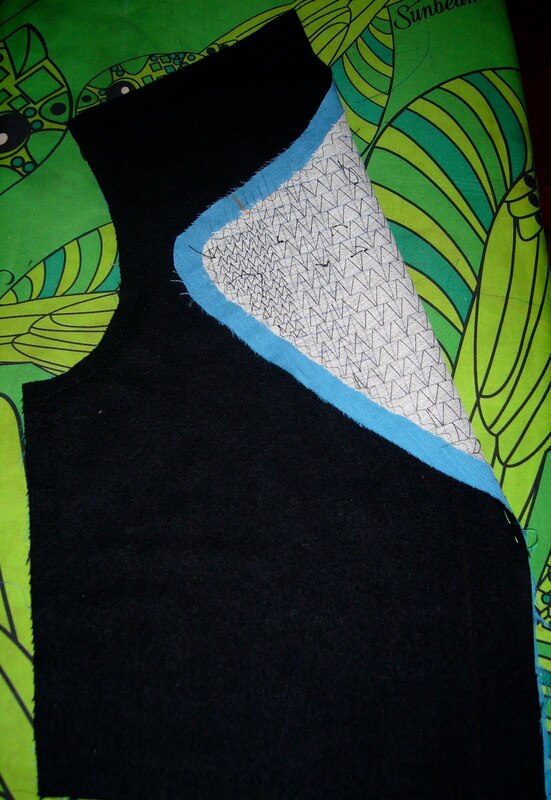 When I was altering the sleeve I realized Phat Chick tells you to alter out most of the sleeve ease. Also, the sleeve in the illustrations was a simple one-piece sleeve with a flattish shirt-style sleeve cap. 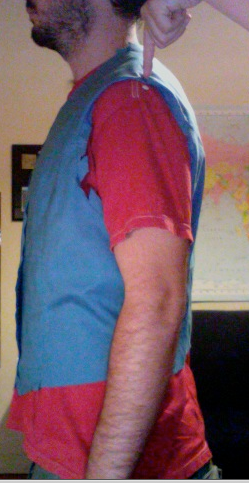 I think I need to raise the sleeve cap and/or add in a little more east to both the front and back. When I sewed in the sleeve, it wouldn’t ease. In fact, the coat body tried to ease to the sleeve. Terrible. At lease the length is good. Jumping Juniper, that’s a bad back. I can’t discuss it. Sloppy. I went back to good old FFRP over my breakfast. They say not to change the sleeve at all, rather match the shoulder point on the sleeve to the new shoulder seam. They further suggest not worrying if the underarm seam won’t match the side seam because no one looks. Good solid advice. However, the beauty of a two-piece sleeve lies in its elbow bend. If I just plonked an unaltered sleeve onto the new shoulder seam placement, the back seam of the sleeve would sit too far up his arm. FFRP did suggest perfectionists should alter the sleeve seams the same way they altered the shoulder seam. 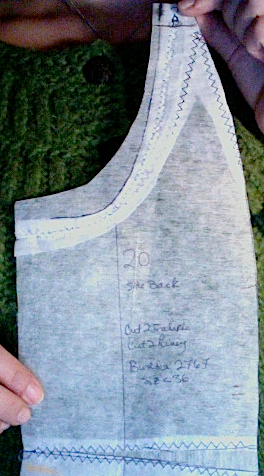 In my case, I sliced 1 1/8″ off the front shoulder seam and added it to the back shoulder seam. I traced a new upper sleeve and did just that. You can see changing the placement of the seam alters the shape of the cap, but not dramatically. Note the shoulder seam marking. This looks better to me. Front. Oh dear. 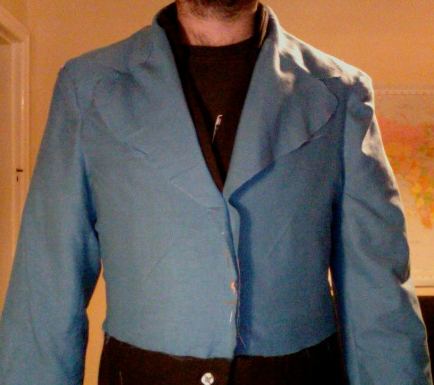 This time we fit with the waistcoat and both shoulder pads in place. The sleeve to your left is Phat Chick. The sleeve to the right is the simpler FFRP. It looks at first glance like the left one is better. However, the collapse in the right one indicates to me that it has the right amount of ease and once it is made up in the proper fabric with a carefully fitted shoulder pad and sleeve head, all will be well. Please correct me if you know otherwise. He still had mobility issues. Back. Better but not great. I realized I added extra width to the back armscythe on the waistcoat to allow for rounded shoulders. I shall need to do this for the coat. Once I do, the left (the FFRP arm) will look smoother. I wanted to avoid making a second muslin of this coat, but I need to. That’s ok, it tipped the balance in favor of deepening the back yoke curve to preserve the style. Left: Phat Chick sleeve. Right: FFRP sleeve. The left looks in desperate need of a higher sleeve cap. The right looks like it needs a sleeve head for support (or an adjustment for smaller arms?) 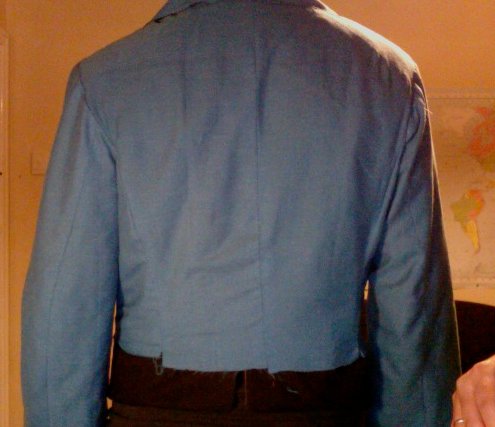 and the coat back needs a little more width. I could either alter the Phat Chick sleeve or alter the back. I believe altering the back (especially since I wanted to anyway) will fix the mobility issues and will smooth out the sleeve wrinkles. 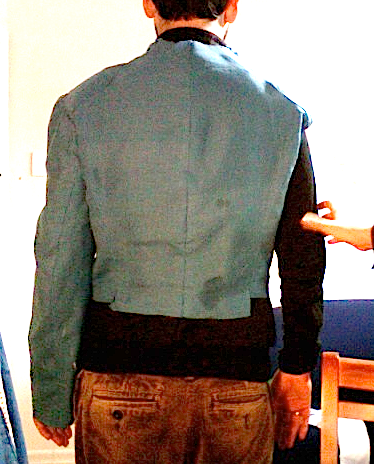 I suspect it would also prove to be a shorter process due to my greater familiarity with the techniques used in back alterations. Phat Chick would work well for a shirt sleeve with a smaller forward roatation, but for a coat sleeve (which has a higher sleeve head and greater ease) it is inappropriate. The next step involves pulling out the basting, remixing the back, and re-assembling the muslin. It sounds like more work than it ought to be. I might stick on the front skirt part while I’m at it. Husband doesn’t like me to call it the skirt, but I’m stuck for any other word. The kilt? As any normal person might, I assumed fitting Husband’s coat would prove a Herculean task. 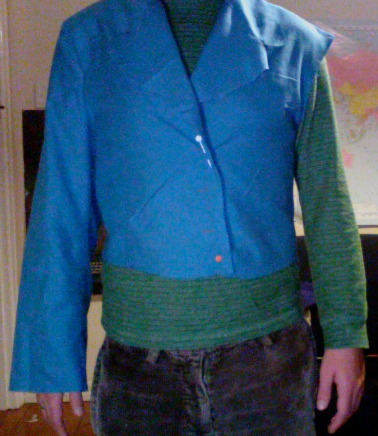 After finishing the waistcoat, I decided I needed a break from tailoring. Now I’m itching to work on it. 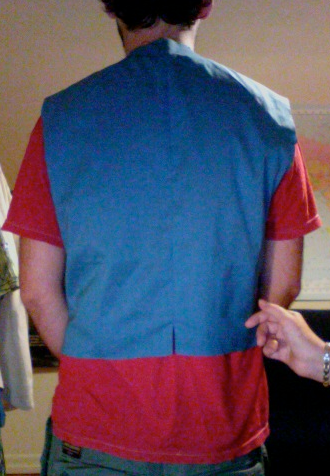 This afternoon I altered the shoulder in the same way I altered the waistcoat pattern. 1 1/8″ forward shoulder (a refinement from my previous esti-measurement of 1.5″ rotation). I decided to leave the length and back as-is and correct the muslin. I enjoy muslins. They bestow no pressure to live up to gorgeous fabric, no one will ever see them, and I can get away with sub-par production techniques. Muslins help ensure the sewing will live up to the gorgeous fabric. I couldn’t help singing as I cut it out. All week I’ve been feeling a soft shade of pale unshakable blue. 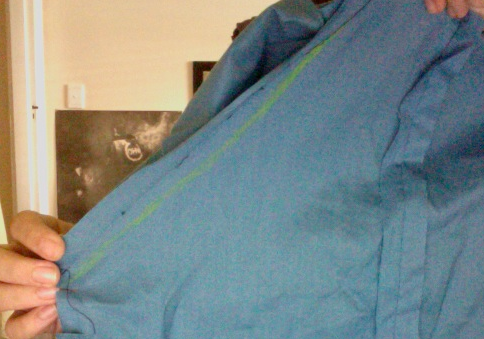 As soon as I started cutting this muslin the blues evaporated. Front. I may lengthen it a bit still, but I don’t think so. He is 1″ shorter waisted than the pattern measurement. 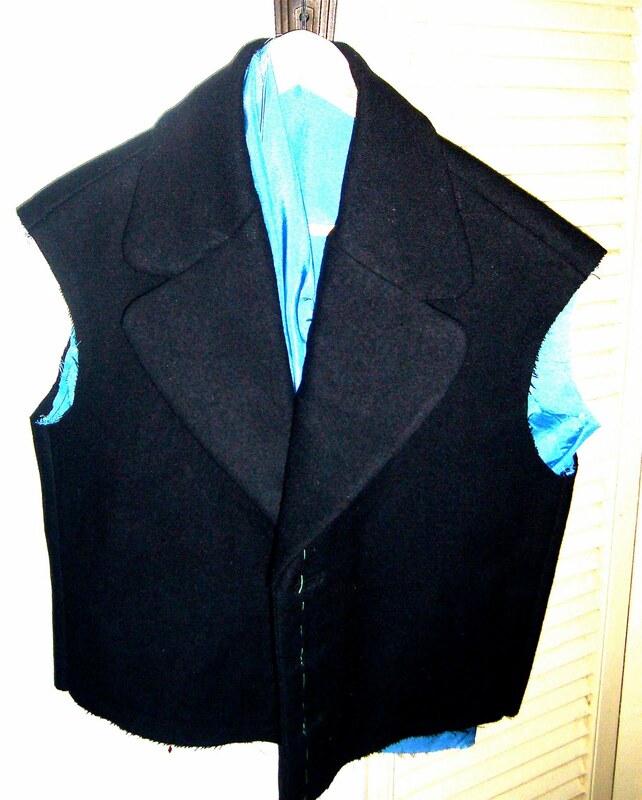 For the waistcoat I added 2″ overall length to suit his aesthetic taste. 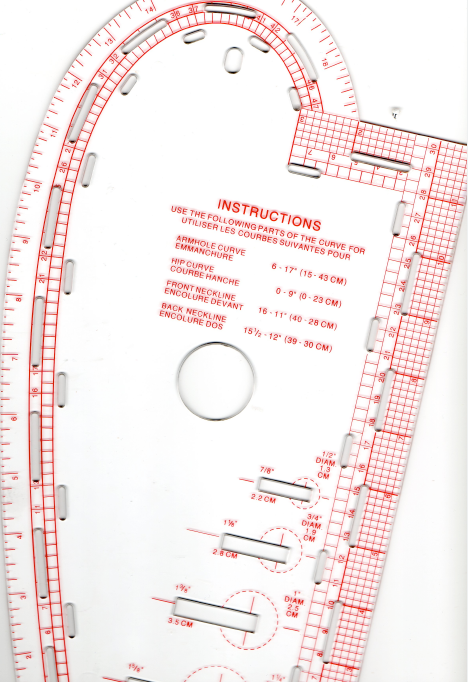 The pattern front measures 1.5″ longer than the front waist measurement. That means it falls 2.5″ below Husband’s front waist, which is about what I would have added to change the style. His left side has a shoulder pad, the right side does not. I’m not sure if it looks too much like protective gear. 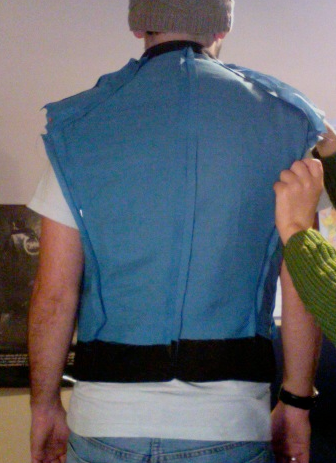 The shoulder pad is not a large one, most of the bulk comes from clothes underneath. His shoulders slope, the edge of the fabric just hides his shoulder. It doesn’t actually drop off that dramatically from his frame… Ideas? Back! I couldn’t believe it, the shoulders sat almost perfectly! I was right about using the waistcoat alterations. Then I realized a mistake and slipped a shoulder pad in place- viola! Perfect shoulders. The side back/back seam needed a little taking in, and I need to add a little to the back armscythe. That’s it. 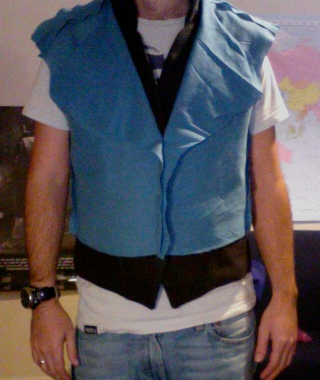 I was expecting such a pain in the neck after the two weeks it took to fit the waistcoat. Side. Note how the shoulder pad sort of evens out the shoulder. I only noticed that in the pictures, when I put it on him I just tried to make it “look right.” Very interesting. Next wave offensive will focus on altering the sleeve pattern and attaching it. His arm length matches the pattern length, so this may not be a headache either. I’ll probably stick the collar on as well to check whether the size of it suits him. Very exciting, I’m dying to do that pad-stitching. Although…. in black flannel, the cut won’t be that obvious anyway… ? I am but a novice tailor, if I may be so grandiose. You all know I’ve been carefully building my knowledge and understanding of tailoring, and I hope I’ve been helpful (or at least interesting) up to this point. 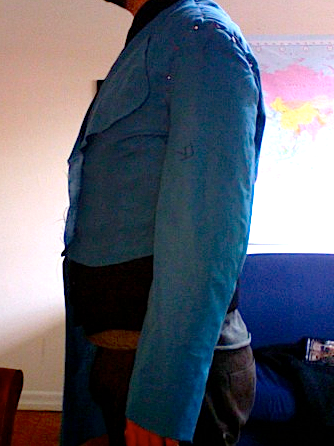 The waistcoat needs buttonhole facings and buttons, which should happen this afternoon. I’m thrilled with how it looks, somehow a Victorian hard-tailored waistcoat easily melds with Husband’s university/ecologist style. Go figure. He’s very impatient for it to be finished, he all but chained me to the sewing machine. I’m so pleased with the mini-tailoring experiment that I can’t help but work out the kinks in the thought-work for the coat. I haven’t forgotten my series on Sewing Habits and Practices, and will follow up soon with a brief discussion on Construction. However, right now I feel like a general on the brink of a strategic battle. Would a wise general charge forth into the night, shooting cannon every which way? Absolutely not. Perhaps a drunk one would. No, a wise general carefully plans his campaign. He pores over maps, plots his strategy, conjures potential difficulties and provides for them in advance. He tests his ideas and gathers intelligence. I draw information and techniques from so many sources, I am afraid I will mix up the order or create more sewing work for myself than is strictly necessary. Also, I hate making something and then running across information later on how I could have made it better. It really upsets me. The I stands for the first wave of muslin/alteration; II stands for the second. I may or may not play with the collar size. 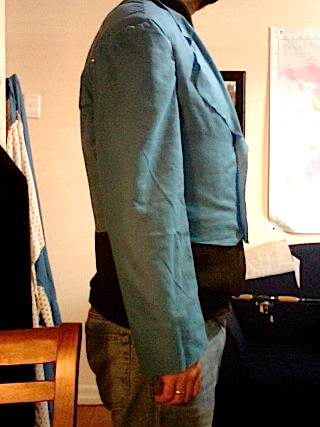 Husband is slightly worried it will be too big, but I think it will work when it is sewn (seam allowances…). I like to leave myself detailed notes, like breadcrumbs. 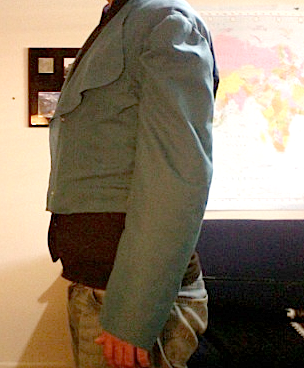 Next time I make a “real” coat, it won’t take so much thinking. I also like to leave space to scribble additional notes as they occur to me. Scrawling in a moleskine feels better to me than just writing. I have lost notebooks in the past to leaky roofs, so it reassures me to scan the pages. 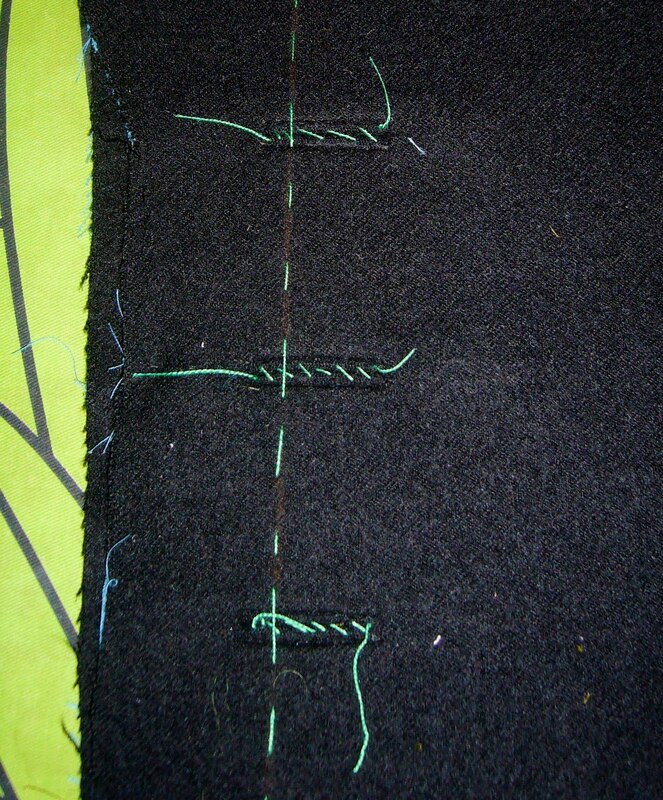 I draw a grid on the backside of the fronts to guide my pad-stitching. 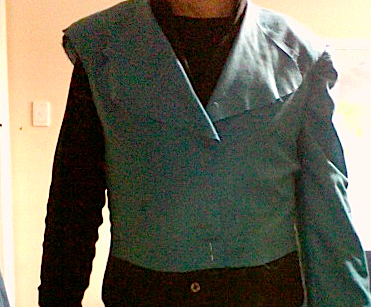 I didn’t pad-stitch the waistcoat and I am sure I will live to regret that. When I made my first tailored jacket, I lost my way with all the taping and interfacing, so I thought this time I would save myself the stress and make a map ahead of time. I can dither and waffle now, but when I’m sewing I like to know where I’m going next. I found it very satisfying to nail down the chest pieces, taping positions and hem strips. I keep reading contradictory and confusing information, so the fact I could wade through it and decide what to do makes me happy. Undecided about waist seam placement. The pattern has no marked waist, I assume it sits at natural waist. I’m not sure if this will look odd with Husband’s other clothes. I looked at John Peacock and it seems to me that most coats of the era hit at the waist in the front, and below the waist in the back. I rather like that. I hoped to get off without muslining the skirts, but it might not be avoidable. I’m not sure about keeping the original pocket placing, which is another reason to muslin the skirt. I can find out where Husband’s hands will slip into the pockets and adjust accordingly. That is as far as I traveled. When it came to the collar, I could not decide between the Palmer Pletsch instructions, the Burda instructions, or the instructions from a 1970’s hard tailoring book I borrowed from none other than Nerdy Seamstress. She’s very generous. Basically the Burda says to baste undercollar to neck edge, then stitch upper collar to facings, then put the two together. Palmer Pletsch says the same thing, but with more exact instructions on which direction to sew, etc. 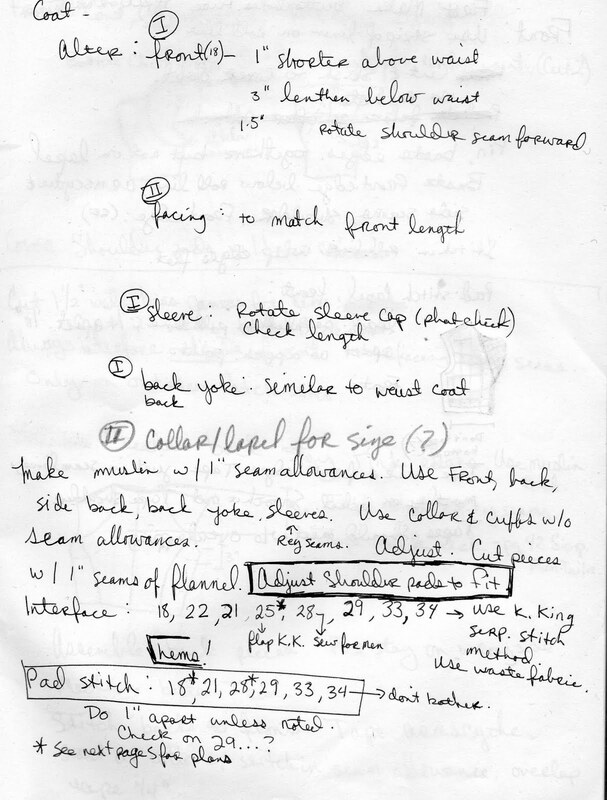 The 1970’s tailoring manual tells me to stitch the facings to the fronts. Then it says to hard press the raw outer edges of the upper collar to the wrong side, and then stitch the upper collar to the neck edge. 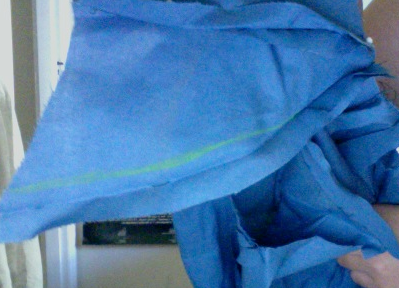 Then I completely assemble the under collar, again hard pressing the raw edges under. 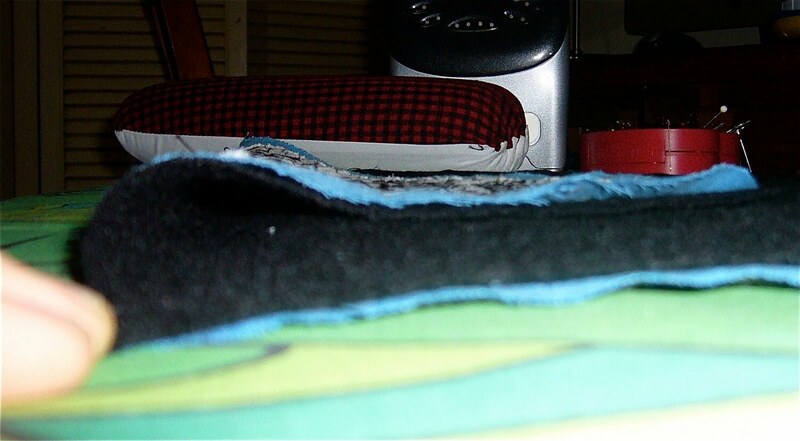 Finally, I stitch the under collar to the upper collar, using a tiny applique stitch. That’s the gist. Both upper and under collars should be interfaced according to the pattern instructions, and I think that will be quite heavy, more easily handled with the tips of my fingers. I might be thoroughly sick of the whole project by then and happily shove it backwards (Palmer Pletsch style) through the machine. I hope that if I am sick of it, I will take a break. Jump in any time and lend some constructive criticism. Anything to help me be better or give me something to think about. Next up, Finished Object: Waistcoat (I promise). 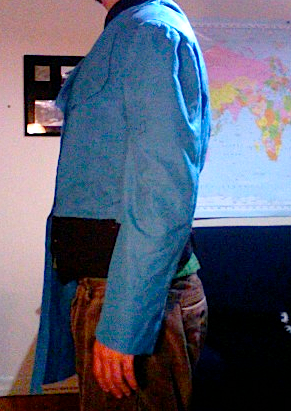 Edited to add: Wowie, I just found Wearing History’s Regency Tailcoat. I know who to ask when I run into problems. I don’t know how I overlooked this, I read her blog and I’ve been scouring the net for tips. Amazing. 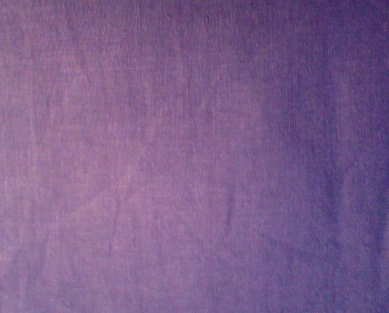 Dye Vat 3- Lilac: I had a piece of bleached linen, slightly more than 2 yards. Up to this point, I dyed fabric in a vat in my kitchen rather than the washing machine so I could allow it to soak up the dye overnight. I decided uniformity of color should trump the depth of color, so I threw the linen, the packet, and some salt into my washer as per the instructions. Nice. Dye Vat 1- Brillant Blue: Done in the washing machine because aside from depth of color, I can see no difference between that and vat soaking. The washing machine method requires less effort on my part. I overdyed both pieces of bamboo jersey- the deep lilac and the obnoxious green. I threw in a few other bits and pieces, as well as my length of tussah peace silk. I wanted to leave it natural but the color was a touch too warm for my skin, it was like vanilla. The texture and hand of the tussah surprises me. In some ways it is like no silk I ever handled; in other ways it is more silk-like than other silks. It took the dye as a dusty blue. I always turn my nose up at that color until I put it on. That blue for me has transformative powers. The new blue-green with the obnoxious greens. I suppose I could overdye those, too. The trouble is if I did that they wouldn’t go with my cotton silk print. I already made a pattern especially for that fabric and I want it to be a part of this collection. It’s very hard. Question: If I made the obnoxious green voiles into a gently fitted to the knee godet bias skirt, could I wear it with my other colors? I have working ideas of what each piece of fabric will be. It is more important to me to make these coats. Then I will make up my wardrobe. I want a piece of hemp and I want a piece of Australian merino jersey to finish things out. I can get those reasonably enough, but I’ll wait a little while. The waistcoat nears completion- I need to stitch the lining and shell together, face the buttonholes, and stitch on the buttons. That’s it. 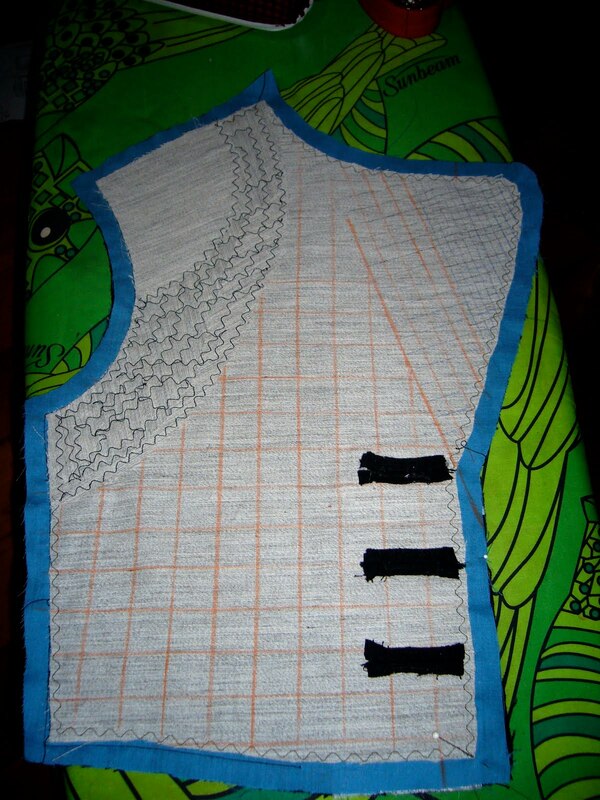 I plan to apply the waistcoat alterations to the coat, make a muslin, then get into it. I plan to pad-stitch the fronts and collars, maybe the cuffs as well. I know how to do that, I know how to put in the buttonholes, I know how to make the pockets. I can’t get him to write back to me about whether he’ll sell me 12 at a time. I just tried to buy 5, with a note on the order asking for 7 more. That should work, no? It has to, I can’t find any other buttons that suit. 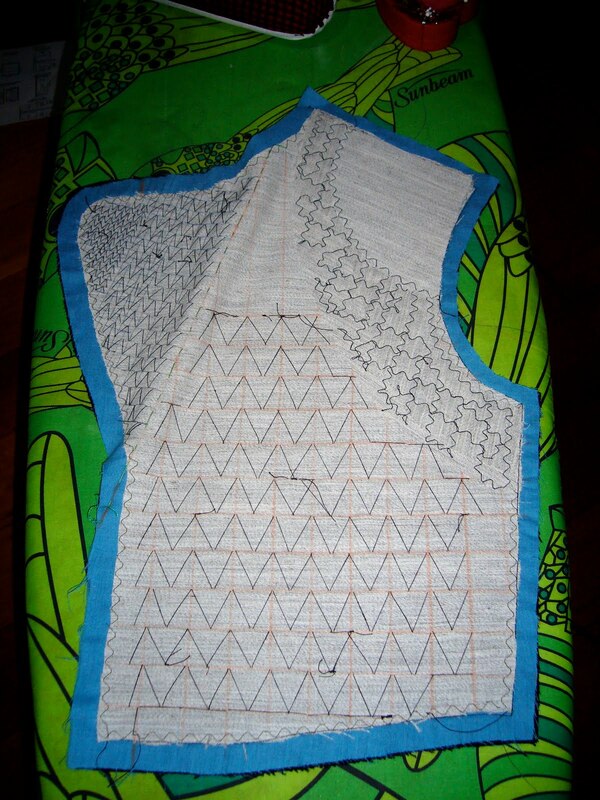 I’m working on the waistcoat in Burda 2767 for my husband. He asked for the Greatcoat; I figured the waistcoat would make a good removable interlining, and would afford me a chance to work with the fabric before sinking my teeth into the coat. 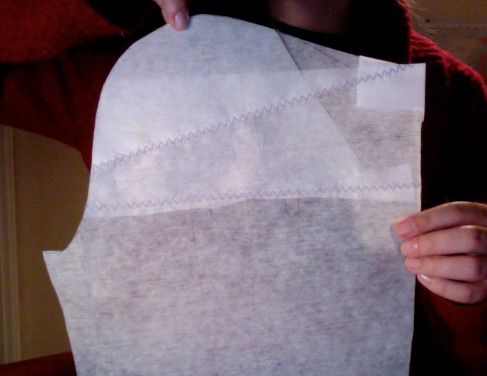 Last night I made the muslin. This also allows me a chance to work on fit. I knew ahead of time that waist length and shoulders might be an issue. 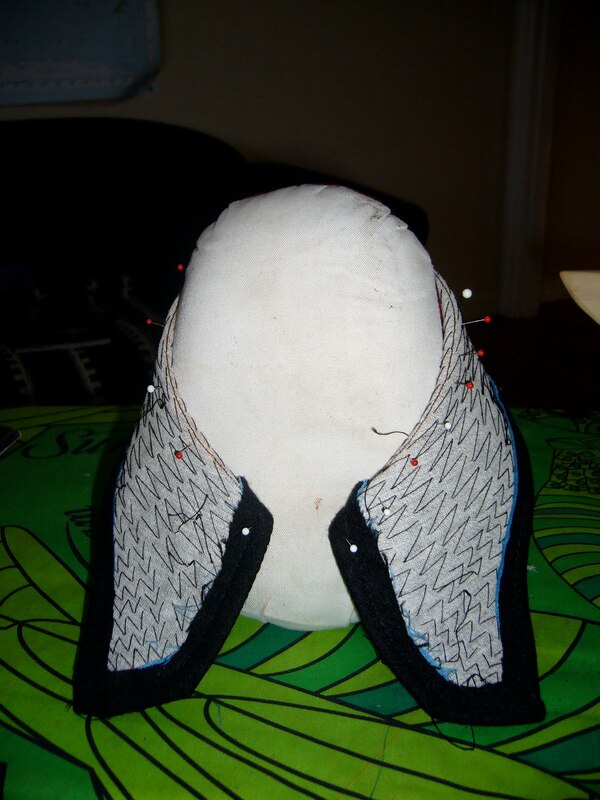 His shoulder seams never sit on his shoulders, and he usually has little hollows of fabric at the front shoulder. These are things only a fit-crazy wife would notice. Based on his measurements, I traced off a size 38. Nearly every one of his measurements fell exactly between size 36 and 38. Usually I just go for whichever size is closer; in cases like this I find it prudent to go for the larger size and adjust a muslin. 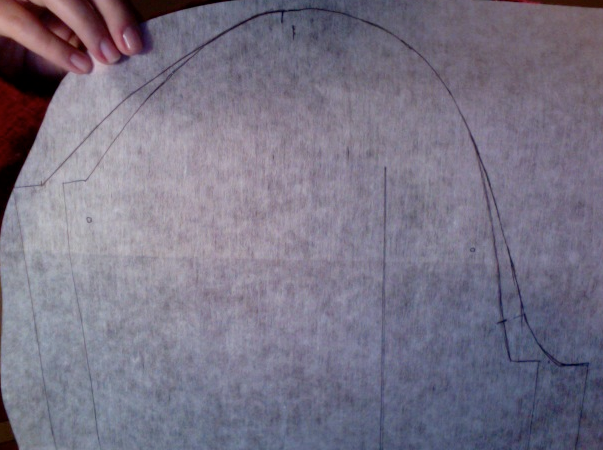 I took flat pattern measurements of the center back, the waist, the chest, and shoulder length on front and back. Then I subtracted the size measurements to give me wearing ease. I like to know how much ease I’m working with, otherwise I would just add or subtract based on size measurements/Husband measurements. For example, if I didn’t care to know how much ease I’m working with, I could look and see that the waist measure for size 38 is 34″. I could compare that to husband’s 33″ waist and easily surmise I need to take off 1″ from the waistline. 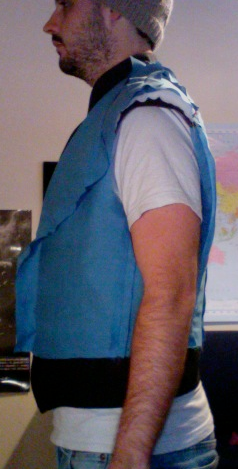 Incidentally, the waistcoat has 6″ of waistline ease. My flat pattern measurements told me to shorten the waist length by 1″. For some reason the chest flat measurement worked out to be perfect so I left it alone, and I took off 1″ total at the waist. I did that by measuring .25″ from the edge of the pattern and tapering the side seam into it. Shoulder length was correct. Then I put it on Husband. The fit was ok. On the left, I trimmed and tucked the armscythe seam allowances, that made it sit smoother. Notice my finger, that is for your benefit to mark the shoulder seam. Notice how his t-shirt sleeve pulls funny because of the forward rotated shoulder. I consulted Betzina and FFRP. I find both of those books good for diagnoses, but still somewhat lacking. 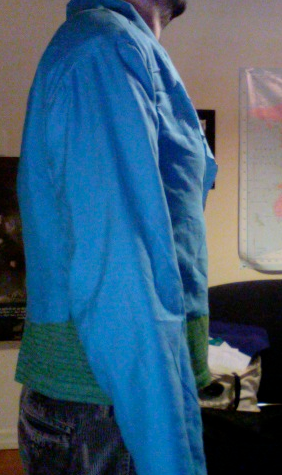 Anyway, I unpicked the shoulder seam, and adjusted it to sit where it ought to. I had to pivot the shoulder seam 1″ forward before it sat where it should. Then I unpicked the back yoke seam on the same side and re-adjusted. From the neck to about 3″ down it sat beautifully, then the seam went awry. I ended up taking about 3/8″ bow shape out of the back at that seam. The seam on the back yoke piece became straighter. I don’t really understand the geometry of it, but it worked. After those adjustments, it sat beautifully on him. I think there is a little too much ease through the chest, but I decided I can adjust that when I put the lining/underlining and exterior pieces on him before I sew them together. They will act differently than the cheap nasty lawn I used here. I see some funny wrinkles down near the bottom, that tells me that he needs a little more room in the seams below the waist. My instincts tell me the bottom of the waistcoat should hit at the top of his pants, or overlap a little. Currently the waistcoat ends about 2″ above where he wears his pants. 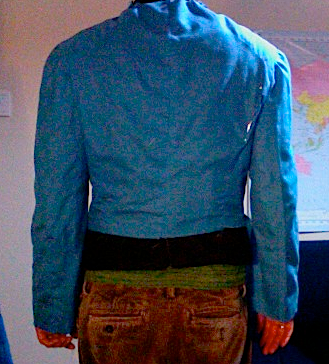 I think I should lengthen it below the waist, to make it longer. I hate editing the style of a garment, but I think it would be stupid to have the gap there. 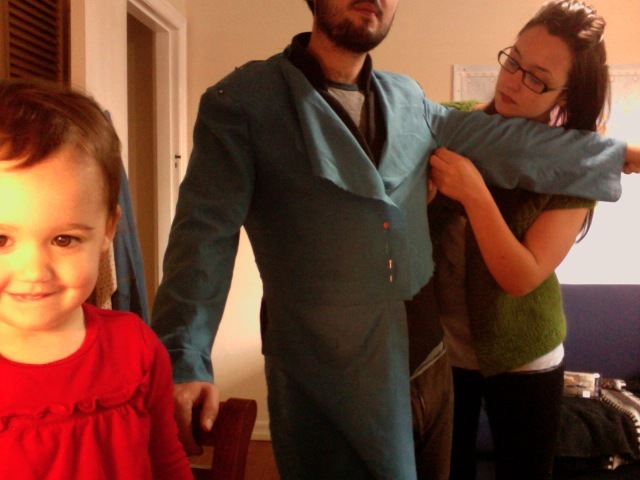 I hope when I make his coat muslin I can extrapolate these alterations and streamline the fitting process. 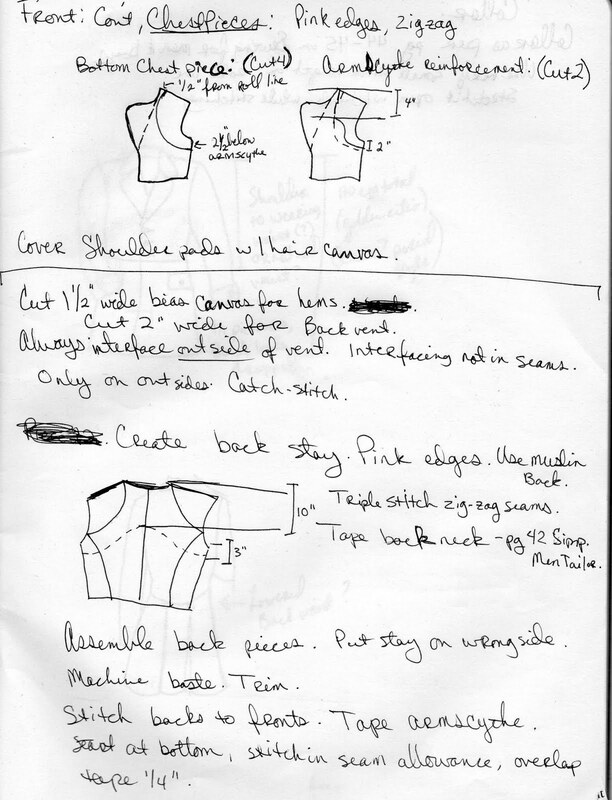 The next step will be learning piped buttonholes/pockets from Kenneth King’s Cool Couture. One of the problems inherent in working in a sewing centre is the constant stream of temptations. When I used to be cash-strapped, it was all well and fine to just avoid entering a sewing shop. Now it is very hard. I bought the book because it picks up where my Palmer Pletsch Jackets for Real People leaves me cold. Don’t get me wrong, I think JFRP is a great book, but a little bit “home-sewing.” K.King kicks it up a notch, very carefully lays down the law about equipment and needle positions, and takes no prisoners. It’s exactly my kind of book, I sat down and read it one end to the other. So this week I’m practicing his piped buttonhole technique, no less than 10 times (Nancy!) or until I reach perfection. I ordered the wool flannel from Charles Parsons, they delivered like lightning, special delivery, and it came on rolls. Like I’m a fabric store. I ordered charcoal for the waistcoat and black for the coat. I find their lengths of fabric very generous. In JFRP, they recommend putting a steamy wool setting iron on your wool for a few seconds to find out if you need to pre-steam it. If it shrinks up, then yes. Mine didn’t, I don’t have to steam 5+ yards of flannel! Calooh callay! For lining, I’ll use a bit of cotton silk that dyed funny, and the interlining an old sweater of Husband’s that I shrank when he was still Boyfriend. Recycling!